I am a beginner in ArcGIS Pro. I asked a question before (Expanding IDW interpolation to borders of country in ArcGIS Pro? ), but I feel like I do not understand the basics enough, so a more basic question now. I have a dataset with concentrations measured at 20 locations in the Netherlands. 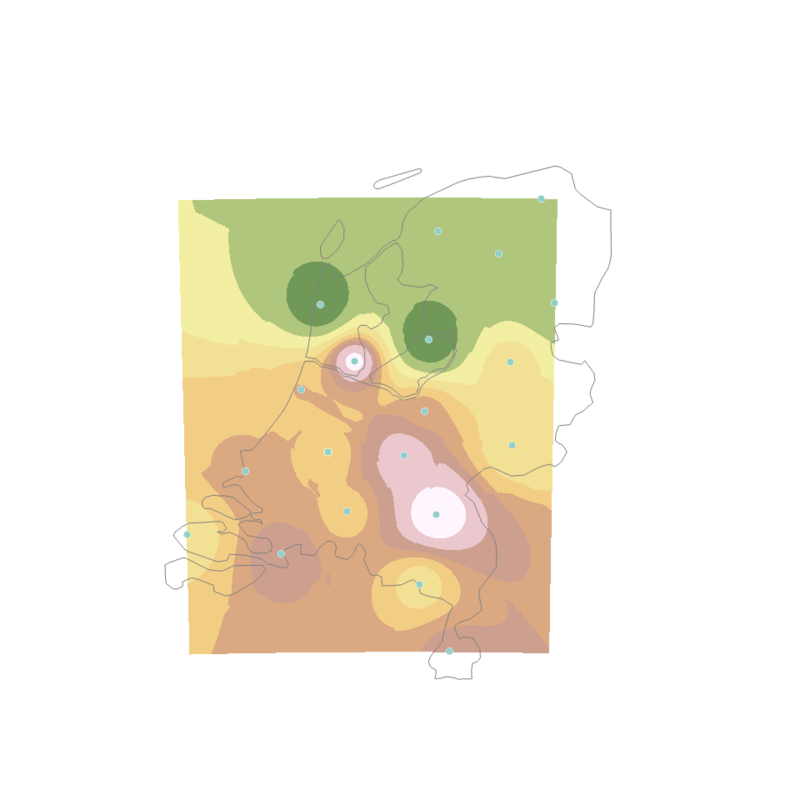 I want to cover all of the Netherlands with IDW interpolation/extrapolation, using the Geostatistical Wizard. I understand I have to set Analysis/Environments/Processing extent to the border of the Netherlands. How can I make a shapefile of the border of the Netherlands so that I can use it to define the processing extent? I inquired in your question and your previous question. Hence, I couldn't add a anwer there because you marked it as answered. Anyway, you dont create a shapefile, you download a shapefile for further processing. Sources can vary, OSM provides with good data, geofabrik.de too. In order to be helpful for this and your previous question I replicated the situation only to realize that my ArcGIS Pro Geostatistical Wizard was not licensed. But I did it in QGIS and here I have the result. So, my step to step procedure. Reviewed the options, cell size 600 and extent of the raster adjusted to layer extent. I believe this is a error you would have to correct in your statistical wizard as your raster is bounded by the points at the extremes . Hence, you have no buffer around your points. See below. Ran the algorithm just to get this image below. Played with the symbology (transparency 80%, background map) . I had no time to look for a better bounding shapefile. Notice that in my test case the islands are too narrow and the Ijsselmeer is not land but is marked as land (not useful in case you want to make land surface comparisons) etc. In case you want a fast solution follow these steps. In case you want to give a go to your ArcGIS solution, try to make the raster size bigger, so it overlaps the whole country. Once you get a result to your liking, extract by mask. As you are using ArcGIS Pro one of the improved things is it's ability to draw data from online portals. You don't need to go anywhere to get any data as generic datasets such as country boundaries are all accessible right inside ArcGIS Pro! Open up the Catalog pane, select Portal, Living Atlas and type "Netherlands", second dataset is a Netherlands Country Boundary for 2017. Not the answer you're looking for? Browse other questions tagged data arcgis-pro extents netherlands or ask your own question. Picking coefficient in Inverse Distance Weighted method of QGIS? Seeking ArcGIS Pro tool to batch change data sources? Hiding border of dot density display in ArcGIS Pro?